This year has been an extraordinary year where our St Andrews community has rallied behind our students’ actions to raise funds for some very worthy causes within our local community, Thailand and our neighbours in Nepal. Part of the IB Learner Profile is that we are ‘Caring’ and ‘Principled’; through our fundraising activities across our school we have shown that we take on our responsibilities towards others seriously, and make a difference in the lives of those we support. 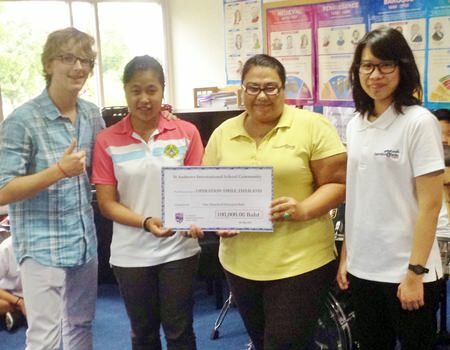 St. Andrews CAS students deliver a 100,000thb check to Operation Smile directors. This year we have held many fundraising activities: the St Andrews Fair, Halloween, Crazy Hair Day, Bake Sales, Have a Heart Activity and the CAS Raffle, which our students have organised as fun and enjoyable activities for each other, but with an underlying cause – to help others. 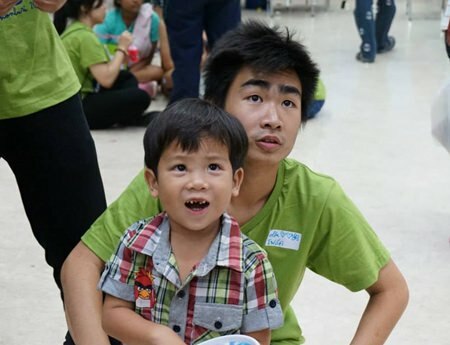 Most recently we have donated 100,000 baht to Operation Smile Thailand to enable them to continue operating on children with cleft lips and cleft palates around Thailand. We have also been there to support them on the Mae Sot Mission in November and Chonburi in May. This week we made a donation of 100,000 baht to the British School, Kathmandu. They have a specific mandate to help the children of the village of Dahding but are now extending their assistance to other communities in need. Operation Smile was just one of several charities St. Andrews raised funds for. In the longer term, the plan is to build 3 earthquake resistant schools for the children of the village, some of whom have physical disabilities and need a school that can allow them to access education with their specific needs. We also donated 64,760 baht to the World Cancer Day 2015 Campaign through the Crazy Hair Day. “More than eight million people a year die from cancer of which more than 60% of those deaths occurred in low- and middle-income countries, the majority in the middle-income segment.” Through our ‘Coins in a Cup’ initiative we raised a significant amount of money to aid this organization search for solutions for cancer. Thank you for all of your generosity, giving money, time and your hard work throughout this year that has enabled us to make these very worthy contributions.